Clearly, Russia supported this operation, to take over Crimea and Donbas, since before the beginning. Russia broke a multitude of international laws in doing so and should be named, shamed, and blamed. Excellent article by Andreas Umland. What are the origins of the armed conflict that has been raging in eastern Ukraine since 2014? Which role did Russia play in the emergence and escalation of the originally unarmed confrontation, in the Donets Basin (Donbas), after the victory of the Euromaidan revolution? When, how and to what degree exactly did Moscow get involved? Which relative weight did local sources of the conflict compared to the impact of foreign factors, i.e. the Kremlin’s covert actions in Ukraine? These and similar questions are not only academic topics hotly debated in Ukraine and the West. The way one answers them has also far-reaching implications for Western thinking, policies and diplomacy with regard to Russia and Ukraine today and tomorrow. Since 2014, an array of new evidence and research has emerged that helps clarifying the picture. For instance, in late 2016, Russia-watchers were intrigued by a leak of emails sent and received by the office of Vladislav Surkov, an official adviser to President Putin, responsible for Russia’s policies towards Ukraine and the Moscow’s satellite states in northern Georgia. The Surkov Leaks then renewed the discussion of Moscow’s involvement in the pseudo-civil war and emergence of “people’s republics” in eastern Ukraine. These leaks confirmed once more that the armed conflict in Ukraine’s eastern Donbas is, to large extent, a Kremlin project. It is merely one part of Moscow’s broader policy of undermining the Ukrainian state after the victory of the Euromaidan revolution in February 2014. Yet, while the Surkov Leaks provided important additional documentation, they do not alter, in principle, our understanding of the Russian-Ukrainian conflict. They confirm with novel details and support with empirical proof earlier mainstream interpretations of the nature of the armed conflict in the Donbas as a covert Russian invasion of Ukraine. Two months before their release, another leak had, however, provided evidence that questioned earlier interpretations of the genesis of the tensions in eastern and southern Ukraine. They deal with the prehistory of the events that eventually led to the start of the still ongoing low-intensity war in the Donets Basin, in April 2014. In August 2016, Ukraine’s General Procurator published a video tape containing illustrated and annotated audio recordings of a number of conversations between Sergey Glazyev, one of Vladimir Putin’s official Advisers within the Administration of the President of Russia, and several pro-Kremlin activists located or living in Southern and Eastern Ukraine. These dialogs were recorded in late February – early March 2014. They vividly illustrate Moscow’s covert support for anti-governmental protests in Ukrainian Russophone regions following the victory of the Revolution of Dignity on 21 February 2014. The tapes reveal the involvement either of the Russian state itself, or of, at least, a significant fraction with the Kremlin, in the initiation, coordination and financing of separatist meetings, demonstrations, pickets and similar actions on Crimea as well as in various regional capitals in Ukraine’s eastern and southern parts immediately after the victory Revolution of Dignity. While the tapes became a big issue in Ukrainian media and caused an angry reaction in Moscow, they have so far been largely ignored by Western newspapers and think-tanks. Mostly, they were – if at all – mentioned only en passant in reports about Ukraine of that time, by European and American journalists and researchers. Their Russian contents were, to be sure, quickly translated into English and annotated with supplementary information by the Ukrainian analytical website UA Position. Yet, only few observers – for instance, Halya Coynash of the Kharkiv Human Rights Protection Group, or Brian Whitmore, then at Radio Free Europe/Radio Liberty and today at CEPA – made, in August 2016, these tapes special topics of their analyses of the Kremlin’s start of its hybrid and proxy war against Ukraine. Yale historian Timothy D. Snyder and Virginia Tech geographer Gerard Toal have since mentioned the Glazyev Tapes in their recent seminal monographs on the confrontation between Russia, Ukraine and the West. The low attention to the Glazyev Tapes, in the international analysts’ community, may have been partly due to the fact that the Ukrainian General Procuracy office has still not published the raw recordings out of which the annotated public tapes were composed. Some may suspect that the published records were tampered with, or/and that they do not reveal the full story of the events they are supposed to illustrate. It is, however, unlikely that these recordings are fakes or doctored. The published conversations are interactive and made by interlocutors whose voices can be easily ascribed to persons, on the basis of their audible statements recorded in video material published elsewhere. The Kremlin would have probably published proof for any manipulations, had they taken place. Nor has there been any other public questioning of the genuineness of these audio documents. The continuing international inattention for the Glazyev Tapes was and is surprising. If they are indeed authentic, the Glazyev Tapes should modify our understanding of the origins, dynamics and nature of the Russian-Ukrainian conflict. The most important aspect of the Glazyev Tapes is arguably not their contents. What is remarkable about these conversations is the time of their recording in late February – early March 2014, i.e. several weeks before the post-Euromaidan civil conflict in eastern and southern Ukraine turned into a pseudo-civil war in the Donbas. Until the publication of the Glazyev Tapes, the prevalent interpretation of the roots of the Russian-Ukrainian War was that Moscow intervened – with, first, largely paramilitary and, later, increasingly regular military forces – into an escalating confrontation between pro-Kyiv and pro-Moscow Ukrainian citizens of the Donets Basin. To be sure, few serious observers ever doubted the Kremlin’s crucial role in turning these initially unarmed – though often already violent – confrontations on the streets of the east and south Ukrainian cities into a putatively civil war by late spring 2014. Yet, there was and is still a debate among Ukrainian and foreign observers of these events about the character of the pro-Moscow protest actions that had preceded, and supposedly led to, the escalation of armed violence. Even many “russocentric” interpreters of the confrontation in Ukraine’s eastern Donbasconceded that the cultural-regional differences between Ukraine’s russophone east and south, on the one side, and ukrainophone west and bilingual center were the predominant cause of the tensions in such Russian-speaking cities as Kharkiv, Luhansk, Donetsk or Odesa, after the Euromaidan. The post-revolutionary anti-Kyiv grass-roots activities of many Russian-speakers in Ukraine – such was the story – led to their confrontation with the new pro-Western and nationally oriented leadership that came to power as a result of the Revolution of Dignity. The local tensions, so it seemed, led to a conflict in the Donbas that the Kremlin eventually felt – depending on the interpreter’s preferences – obliged, forced or convenient enough to intervene in. To be sure, the evidence contained in the Glazyev Tapes does not nullify the factor of Ukrainian inter-regional strains (not a particularly unique characteristic of Ukraine, in any way) in the emergence of the Donbas conflict. In fact, the conversations published do not concern the Donetsk and Luhansk oblasts, but other regions in russophone Eastern and Southern Ukraine. One can only infer from these recordings that similar Russian mingling was happening in the Donbas too, and that the now documented early-on involvement of the Kremlin in certain locations is merely the tip of a far larger iceberg. The Glazyev Tapes could, in fact, be seen as strengthening the argument about the relevance of regional differences within russophone Ukraine – an old theme in post-Soviet sub-national studies. They indicate that Moscow was engaged in a broader attempt to destabilize the largely Russian-speaking regions of Ukraine, but was only able to instigate a pseudo-civil war in the Donets Basin. Russia’s informal influence was, however, not strong enough to do so in other eastern and southern regions in which Glazyev with his local partners, as the tapes illustrate, actively supported secessionist tendencies. The leak could be thus read as evidence for earlier interpretations emphasizing the crucial role of specifically regional factors in Ukraine’s break-up. Yet, the time of the recording and documented depth of Glazyev’s involvement in these Ukrainian events also support a different narrative. They imply that Russia was by no means merely an additional third actor or late intervening factor when the protests turned massively violent and led to the first armed skirmishes, in April 2014. Rather, the Glazyev Tapes indicate that Moscow had been already entangled in the still largely unarmed protests across eastern and southern Ukraine immediately following the victory of the Euromaidan, in late February and early March 2014 (if not before). The recordings suggest that the Kremlin had been behind, at least, some separatist activities several weeks before the actual war started. Yet, Moscow’s clandestine pre-war activities remained remarkably unsuccessful in mainland Ukraine, in late February and early March 2014. Surprisingly, the distinctly weak Ukrainian state – just shaken by a full-scale revolution – was still strong enough to resist Russia’s clandestine non-military assault on its sovereignty and integrity, at that point. The only partial exclusion, in late February 2014, was of course Crimea where – as we already know – Russian special forces without insignia had played, however, a crucial role in starting the secession process. The genealogy of the Russian-Ukrainian conflict appears, after the publication of the Glazyev Tapes, somewhat different than before. It looks now as if Moscow or, at least, a part of the Russian leadership was, in late February 2014, starting a comprehensive attempt to annex not only Crimea, but also large chunks of mainland southern and eastern Ukraine, i.e. to create a Novorossiia (New Russia). Yet, in order to do so, pro-Russian local activists had first to produce some legal or/and political pretext for an official Russian military intervention. An employment of Russian troops abroad had just been made (domestically) legal by a special Federation Council resolution adopted on 1 March 2014 granting the President of Russia the right “to use Russian military forces in Ukraine to improve public and political situation in that country” (– a right revoked in June 2014). Yet, for the Russian public and international audiences, it still needed a weighty justification for such plain expansionism coming from inside Ukraine. To this purpose, an – at least seemingly – official document or particularly grave political event would first have to appear in the respective Ukrainian region up for invasion, and to provide some basic fodder for the Kremlin propaganda machine. Such an initial move in this or that Ukrainian region could have then been spun by Russian media as providing sufficient legitimacy for preparing and conducting an armed “humanitarian” intervention by Moscow on Ukrainian territory – and to finally annex the occupied areas either formally or informally. This scenario materialized more or less on Crimea. Glazyev’s conversations with the Russian imperialist politician Konstantin Zatulin and Crimean pro-Russian separatist Sergey Aksyonov, on the tapes, illustrates some of the particulars. Yet, even in Simferopol, the crucial session of the Autonomous Republic’s parliament that initiated Crimea’s secession had to be assembled and made to vote with the help of Moscow’s paramilitary forces, as one of their members, notorious Igor Girkin (“Strelkov”), detailed in a later interview. Something similar – as the Glazyev Tapes indicate – was also tried or, at least, intended in Kharkiv, Odesa and other cities. Yet, the hoped-for Ukrainian calls for Russian help did not come about as planned, during the first few weeks after the Euromaidan. The following “civil war” that only began more than a month later in the Donets Basin was seemingly merely Moscow’s Plan B. It may have been an altogether improvised scenario that spontaneously grew out of the initially unarmed, yet abortive subversion of the Ukrainian state by Russia-directed activists, in late February and early March 2014. More revelations and research will be necessary to fully verify, further specify and properly document this course of events. To be sure, one could have suspected something like this already before the Glazyev Tapes were published. There had been two obvious contradictions in the “ukrainocentric” narrative of the origins of the conflict in the Donbass: First, comparative regional studies have emphasized some peculiarly “uncivil” traits of society in the Ukrainian Donbas. Ukraine’s easternmost population has been characterized as relatively more pro-Soviet and patriarchal than people in many other Ukrainian regions. After Ukraine’s assumption of independence in 1991, the Donbas’s crucial social, political and economic structures were, moreover, largely captured by the semi-criminal Donetsk clan and its political wing, the Party of Regions. Against this background, it was, in spring 2014, remarkable how well and sudden the most Soviet-nostalgic sections of the Donbas’s society managed to seemingly self-organize a large anti-governmental protest without much (official) help from the dominant regional Donetsk clan. Even before the Glazyev Tapes appeared, this story – implicit in the civil war narrative of the Russian-Ukrainian conflict – looked, at least, incomplete. The Glazyev Tapes contribute to explaining the reasons for these two contradictions, i.e. the low social capital and civic under-organization of the rebellious region, and the absence of the Donbas’s regional notability in the leadership of the uprising. The allegedly popular insurrection in eastern and southern Ukraine was from its beginning in late February 2014 an undertaking meticulously guided and heavily supported from Moscow. The Russian Spring in the Donbas did thus not need an active local civil society. As political leadership and resources were provided by Moscow, an involvement of regional dignitaries was not necessary for the rebellion to happen. This interpretation should not only modify public narratives of the “Ukraine Crisis,” but also have repercussions for the Western approach to the Minsk Agreements. In particular, the West should re-consider its insistence on Ukraine’s soon fulfillment of the political parts of the Minsk Agreements. 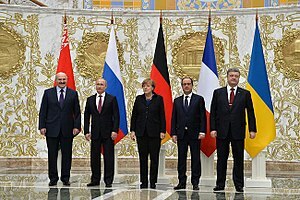 Not only is it obvious that Ukraine was forced to accept enormous political concessions to Moscow against the immediate background of extremely bloody Russian military offensives, shortly before or during the negotiations of the various Minsk Agreements in September 2014 (Ilovaisk) and February 2015 (Debaltseve). The Glazyev Tapes also illustrate that the social rationale for far-reaching new political rules in the Donbas envisaged in the Minsk Agreements – a considerable reduction of Ukraine’s sovereignty, in the currently occupied territories – is slim. A popular Western interpretation of the concessions to the separatists in these Agreements had been that the mere fact of an, at least, initially grass-roots insurgency in the Donbas should be somehow reflected in its future status. Yet, the Glazyev Tapes illustrated, in 2016, that the entire East Ukrainian uprising had from its start not been as popular a phenomenon as it had earlier seemed. If one acknowledges the Russian involvement in, and imperial rather than local dimension of, the seeming insurgency, then the apparent compromise in the Minsk Agreements assumes a different notion. The Minsk compromise appears now not any longer as a result of Ukrainian and Western consideration of certain peculiarities of the Donets Basin. Rather, a future special status of the currently occupied territories looks, after publication of the Glazyev Tapes, as a strange reward for the partial successes that Russia had in fueling otherwise weak separatist tendencies in eastern Ukraine following the victory of the Euromaidan. Ukraine has been undergoing a general decentralization drive since 2014 – a development unrelated to the Minsk process and a direct result of the victory of the Revolution of Dignity. A special status for the currently occupied territories, as foreseen in the Minsk Agreements, is thus redundant. All regions of Ukraine are currently or will soon be acquiring new rights, additional responsibilities and greater autonomy. If the now Moscow-controlled territories return under Kyiv’s control, they would sooner or later also benefit from general Ukrainian decentralization. It is less the Donbas’s specific regional interests than the partial successes of Russia’s secret subversion efforts that has found their way into the texts of the three deals between the Ukrainian government and the separatist pseudo-republics in Minsk. The West should treat the questions of whether, when and how Kyiv needs to implement the respective domestic political articles of the Minsk Agreements accordingly. Reblogged this on Andreas Umland.